Dealership technicians are factory trained to a uniformly high standard, and use the latest diagnostic and servicing equipment. TeamMoto’s Master Plan Warranty – There when you need it! Ask yourself... What would you do in the event of a costly failure occurring? How would you cover this cost? Have you or someone close to you ever experienced a large repair bill that would have been covered by a reputable warranty? It makes good sense for any motorcycle purchaser to be protected from financial impact if an unforeseen mechanical failure were to occur by simply extending the warranty at time of purchase. The cost of part/s and labour to repair or replace any of the covered components of the motorcycle are covered under the Master Plan Warranty. TeamMoto’s Master Plan Warranty is available for 1, 2 or 3-years, and with flexible payment options, can you afford not to have it? 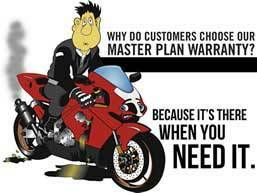 Make sure you ask about the benefits of Master Plan Warranty when you enquire about your next motorcycle purchase.